This article is about the men's football club. For the women's football club, see Stoke City L.F.C. Stoke City Football Club is an English professional football club based in Stoke-on-Trent, Staffordshire. Founded as Stoke Ramblers in 1863 the club changed its name to Stoke in 1878 and then to Stoke City in 1925 after Stoke-on-Trent was granted city status. They are the second-oldest professional football club in the world, after Notts County, and were a founding member of the Football League in 1888. The team competes in the Championship, the second tier of English football. 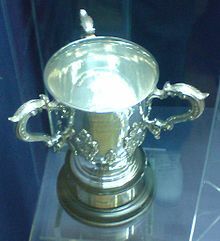 Their first, and to date only, major trophy, the League Cup was won in 1972, when the team beat Chelsea 2–1. The club's highest league finish in the top division is fourth, which was achieved in the 1935–36 and 1946–47 seasons. Stoke played in the FA Cup Final in 2011, finishing runners-up to Manchester City and have reached three FA Cup semi-finals; in 1899 then consecutively in 1971 and 1972. Stoke have competed in European football on three occasions, firstly in 1972–73 then in 1974–75 and most recently in 2011–12. The club has won the Football League Trophy twice, in 1992 and in 2000. Stoke's home ground is the 30,089 all-seater, bet365 Stadium. Before the stadium was opened in 1997, the club was based at the Victoria Ground, which had been their home ground since 1878. The club's nickname is 'The Potters', named after the pottery industry in Stoke-on-Trent and their traditional home kit is a red and white vertically striped shirt, white shorts and stockings. Stoke's traditional rivals are Midlands clubs West Bromwich Albion and Wolverhampton Wanderers whilst their local rivals are Port Vale with whom they contest the Potteries derby. Main article: History of Stoke City F.C. Stoke City F.C. was formed in 1863 under the name Stoke Ramblers, when pupils of Charterhouse School formed a football club while they were apprentices at the North Staffordshire Railway works in Stoke-upon-Trent. The club's first documented match was in October 1868, against an EW May XV at the Victoria Cricket Club ground. Henry Almond, the club's founder, was also captain, and scored the club's first ever goal. During this period they played at the Victoria Cricket Ground; however, they switched to a nearby ground at Sweetings Field in 1875 to cope with rising attendances. The Stoke team of 1877–78. In 1878, the club merged with Stoke Victoria Cricket Club, and became Stoke Football Club. They moved from their previous ground, Sweetings Field, to the Athletic Club ground, which soon became known as the Victoria Ground. It was around this time that the club adopted their traditional red-and-white striped kit. In August 1885, the club turned professional. Stoke were one of the twelve founding members of the Football League when it was introduced in 1888. The club struggled in their first two seasons, 1888–89 and 1889–90, finishing bottom on both occasions. In 1890 Stoke failed to be re-elected and joined the Football Alliance, which they won and thus were re-elected to the Football League. Stoke spent the next 15 seasons in the First Division and reached the FA Cup Semi-final in the 1898–99 season before being relegated in 1907. Stoke went bankrupt and entered non-league football until 1914, when the First World War meant the Football League was suspended for four years. During the wartime period, Stoke entered the Lancashire Primary and Secondary leagues. When football recommenced in August 1919, Stoke re-joined the league. The club became owners of the Victoria Ground in 1919. This was followed by the construction of the Butler Street stand, which increased the overall capacity of the ground to 50,000. In 1925, Stoke-on-Trent was granted "city status" and this led the club to change its name to Stoke City F.C. The 1930s saw the debut of club's most celebrated player, Stanley Matthews. Matthews, who grew up in Hanley, was an apprentice at the club and made his first appearance in March 1932, against Bury, at the age of 17. By end of the decade, Matthews had established himself as an England international and as one of the best footballers of his generation. Stoke achieved promotion from the Second Division in 1932–33 – as champions – however Matthews only featured in fifteen games in this season. He did however score his first goal for the club in a 3–1 win against local rivals Port Vale. By 1934, the club's average attendance had risen to over 23,000, which in turn allowed the club to give the manager Tom Mather increased transfer funds. The club was now considered one of the top teams in the country. It was in this period that the club recorded its record league win, a 10–3 win over West Bromwich Albion in February 1937. In April of that year, the club achieved its record league crowd – 51,373 against Arsenal. Freddie Steele's 33 league goals in the 1936–37 season remains a club record. Following the resumption of the FA Cup after World War II, tragedy struck on 9 March 1946, as 33 fans died and 520 were injured during a 6th round tie away against Bolton Wanderers. This came known as the Burnden Park disaster. In 1946–47, Stoke mounted a serious title challenge. The club needed a win in their final game of the season to win the First Division title. However, a 2–1 defeat to Sheffield United meant the title went to Liverpool instead. Stanley Matthews left with 3 games remaining of the 1946–47 season, opting to join Blackpool at the age of 32. Stoke were relegated from the First Division in 1952–53; during the season Bob McGrory resigned as the club's manager after 17 years in the role. Former Wolverhampton Wanderers defender Frank Taylor took over at the club looking to gain promotion back to the First Division. However, after seven seasons in the Second Division without promotion, Taylor was sacked. Taylor was shocked at being fired and vowed never to be associated with football again. Tony Waddington was appointed as the club's manager in June 1960. He joined the club in 1952 as a coach, before being promoted to assistant manager in 1957. Waddington pulled off a significant coup by enticing Stanley Matthews – then 46 years old – back to the club, 14 years after he had departed. The return of Matthews helped Stoke to an improved eighth position in 1961–62. Promotion was achieved in the following season, with Stoke finishing as champions. In their first season back in the top flight, 1963–64, Waddington guided Stoke to a mid-table finish. Stoke reached the 1964 Football League Cup Final, which they lost 4–3 to Leicester City over two legs. Waddington counted on experience; Dennis Viollet, Jackie Mudie, Roy Vernon, Maurice Setters and Jimmy McIlroy were all players signed in the latter stages of their careers. Matthews was awarded a knighthood for services to football in the 1965 New Year's Honours list. This was followed by his final appearance for the club against Fulham in February 1965, shortly after his 50th birthday. Gordon Banks, England's 1966 World Cup-winning goalkeeper, joined in 1967 for £52,000 from Leicester. Regarded as the best goalkeeper in the world, Banks proved to be a shrewd signing for Waddington as he helped the club maintain stability in the First Division. During the close season of 1967, Stoke City played in the one-off United Soccer Association which imported clubs from Europe and South America. Stoke played as the Cleveland Stokers and finished as runner-up of the Eastern Division. The club won its first major trophy on 4 March 1972 in the League Cup Final against Chelsea. Stoke won 2–1 in front of a crowd of 97,852 at Wembley with goals from Terry Conroy and George Eastham. Preceding this victory, Stoke had progressed through 11 games in order to reach the final. This included four games with West Ham United in the semi-final; the two-legged tie was replayed twice. Stoke fared well in the FA Cup; the club progressed to the semi-final stage in both the 1970–71 and 1971–72 seasons. However, on both occasions Stoke lost to Arsenal in a replay. Stoke also competed in the UEFA Cup in 1972 and 1974 losing at the first attempt to 1. FC Kaiserslautern and Ajax respectively. In January 1976, the roof of the Butler Street Stand was blown off in a storm. The repair bill of nearly £250,000 put the club in financial trouble; key players such as Alan Hudson, Mike Pejic and Jimmy Greenhoff were sold to cover the repairs. With the team depleted, Stoke were relegated in the 1976–77 season. Waddington, after a spell of 17 years in charge, left the club after a 1–0 home defeat to Leicester in March 1977. Waddington was replaced by George Eastham in March 1977. However, he could not prevent the club's relegation to the Second Division in 1976–77. Eastham left in January 1978 after only ten months in charge, and was replaced by Alan Durban from Shrewsbury Town. Durban achieved promotion to the First Division in the 1978–79 season, but after consolidating the club's position in the First Division, he left to manage Sunderland in 1981. Richie Barker was appointed for the 1981–82 season, but was sacked in December 1983 and was replaced by Bill Asprey. Asprey decided to bring back veteran Alan Hudson, and the decision paid off as an improved second half of the season saw Stoke avoid relegation on the final day of the 1983–84 season. The 1984–85 season proved to be disastrous. Stoke finished the season with only 17 points, with just three wins all season. Mick Mills was appointed player-manager for the 1985–86 season, but was unable to sustain a challenge for promotion in his four seasons as manager and was sacked in November 1989. His successor, Alan Ball, Jr., became the club's fifth manager in ten years. Ball struggled in his first season in charge, 1989–90, and Stoke were relegated to the third tier of English football after finishing bottom of the Second Division. Ball kept his job for the start of the following season, 1990–91, but departed during February 1991, in an indifferent season that saw Stoke finish 14th in the Third Division, Stoke's lowest league position. Ball's successor, Lou Macari, was appointed in May 1991, prior to the start of the 1991–92 season. He clinched silverware for the club; the 1992 Football League Trophy was won with a 1–0 victory against Stockport County at Wembley, with Mark Stein scoring the only goal of the match. The following season, 1992–93, promotion was achieved from the third tier. Macari left for his boyhood club Celtic in October 1993 to be replaced by Joe Jordan; Stein also departed, in a club record £1.5 million move to Chelsea. Jordan's tenure in charge was short, leaving the club less than a year after joining, and Stoke opted to re-appoint Lou Macari only 12 months after he had left. Stoke finished fourth in 1995–96 but were defeated in the play-off semi-final by Leicester City. Macari left the club at the end of the season. His last match in charge was the final league game at the Victoria Ground. Mike Sheron, who was signed two years previously from Norwich City, was sold for a club record fee of £2.5 million in 1997. 1997–98 saw Stoke move to its new ground, the Britannia Stadium, after 119 years at the Victoria Ground. Chic Bates, Macari's assistant, was appointed manager for the club's first season in the new ground. He did not last long though, and was replaced by Chris Kamara in January 1998. Kamara could not improve the club's fortunes either, and he too left in April. Alan Durban, previously Stoke's manager two decades earlier, took charge for the remainder of season. Despite his best efforts, Durban was unable to keep the club up, as defeat against Manchester City on the final day of the season consigned Stoke to relegation to the third tier. Brian Little, formerly manager of Aston Villa, took charge for the 1998–99 season. Despite an impressive start, the team's form tailed off dramatically in the latter stages of the season, which led to Little leaving the club at the end of the season. His successor, Gary Megson, was only in the job for four months. Megson was forced to depart following a takeover by Stoke Holding, an Icelandic consortium, who purchased a 66% share in Stoke City F.C. for £6.6 million. Stoke became the first Icelandic-owned football club outside of Iceland. They appointed the club's first foreign manager, Gudjon Thordarson, who helped Stoke win the Football League Trophy in the 1999–2000 season, with a 2–1 win over Bristol City in front of a crowd of 85,057 at Wembley. Thordarson achieved promotion at the third time of asking in 2001–02 after previous play-off defeats against Gillingham and Walsall. Cardiff City were defeated in the semi-final before a 2–0 win against Brentford at the Millennium Stadium secured promotion. Despite achieving the goal of promotion, Thordarson was sacked by Gunnar Gíslason just five days later. Steve Cotterill was drafted in as Thordarson's replacement prior to the start of the 2002–03 season, but resigned in October 2002 after only four months in charge. Tony Pulis was appointed as Stoke's new manager shortly after. Pulis steered Stoke clear of relegation, with a 1–0 win over Reading on the final day of the season keeping the club in the division. However, Pulis was sacked at the end of the 2004–05 season, following disagreement between himself and the club's owners. Dutch manager Johan Boskamp was named as Pulis' successor on 29 June 2005, only one day after Pulis was sacked. Boskamp brought in a number of new players from Europe, but his side was inconsistent and only a mid-table finish was achieved. Boskamp left at the end of the 2005–06 season amidst a takeover bid by former chairman Peter Coates. On 23 May 2006, Coates completed his takeover of Stoke City, marking the end of Gunnar Gíslason's chairmanship of the club. Coates chose former manager Tony Pulis as Boskamp's successor in June 2006. Pulis took Stoke close to a play-off place, but an eventual eighth-place finish was achieved in the 2006–07 season. Stoke won automatic promotion to the Premier League on the final day of the 2007–08 season, finishing in second place in the Championship. A 3–1 defeat to Bolton Wanderers on the opening day of the 2008–09 season saw Stoke written off by many media outlets as relegation certainties. Stoke managed to turn the Britannia Stadium into a "fortress", making it difficult for teams to pick up points there. In their first home match, Stoke defeated Aston Villa 3–2, and wins also came against Tottenham Hotspur, Arsenal, Sunderland and West Bromwich Albion. After a 2–1 win at Hull City, Stoke confirmed their place in the Premier League as the Potters finished 12th in their return to the top flight, with a total of 45 points. Stoke finished the following 2009–10 season in a respectable 11th place, with 47 points. Stoke also made it to the quarter-finals of the FA Cup for the first time since 1972, defeating York City, Arsenal and Manchester City before losing out to eventual winners Chelsea. Stoke reached the FA Cup Final for the first time, beating Cardiff City, Wolverhampton Wanderers, Brighton & Hove Albion, West Ham United and a famous 5–0 win against Bolton, the largest post-war FA Cup semi-final victory. However, they lost the final 1–0 to Manchester City. By reaching the final, Stoke qualified for the 2011–12 UEFA Europa League. In the Europa League, Stoke advanced past Hajduk Split, Thun and a tough group containing Beşiktaş, Dynamo Kyiv and Maccabi Tel Aviv which Stoke managed to progress through finishing in second position. City's reward was a tie against Spanish giants Valencia and despite putting up a spirited second leg performance, Stoke went out 2–0 on aggregate. In the Premier League, Stoke made the high-profile signing of Peter Crouch as they finished in a mid-table position for a fourth time. The 2012–13 season saw Stoke make little progress, and Pulis left the club by mutual consent on 21 May 2013. Pulis was replaced by fellow Welshman Mark Hughes, who signed a three-year contract on 30 May 2013. Hughes led Stoke to a ninth-place finish in 2013–14, their highest position in the Premier League and best finish since 1974–75. The 2014–15 season saw Stoke again finish in ninth position this time, with 54 points. Despite breaking their transfer record twice on Xherdan Shaqiri and then Giannelli Imbula, in 2015–16, Stoke did not make any progression and finished in ninth position for a third season running. Stoke declined in 2016–17, finishing in 13th position. In January 2018, Hughes was sacked after a poor run leaving the club in the relegation zone. He was replaced by Paul Lambert, who could not prevent the club from ending its 10-year spell in the Premier League. Following their relegation to the Championship, Lambert resigned and he was replaced with former Derby County boss Gary Rowett on a three year contract. Despite being tipped to challenge for promotion, the team made a poor start to the season - achieving just 8 wins in their opening 26 matches. Rowett began to become unpopular with supporters and he was subsequently sacked on 8 January 2019 with the team 14th in the table. He was replaced with Luton Town boss Nathan Jones. Stoke moved to the all-seater ground now known as the bet365 Stadium in 1997. It is not clear where Stoke's original playing fields were located. Their first pitch was certainly in the site of a present burial ground in Lonsdale Street, although there is evidence that they also played on land near to the Copeland Arms public house on Campbell Road. In 1875, they moved to Sweetings Field, which was owned by the mayor of Stoke, Alderman Sweeting. It is estimated that as many as 200–250 spectators were attending home matches at Sweetings Field, paying one penny for admission. Stoke were to stay at Sweetings Field until a merger with the Stoke Victoria Cricket Club in March 1878, when Stoke moved to the Victoria Ground. The first match to be played at the Victoria Ground was a friendly against Talke Rangers on 28 March 1878; Stoke won 1–0 in front of 2,500 fans. The ground was originally an oval shape to cater for athletics, and this shape was retained for the next 30 years. Major development work began in the 1920s, and by 1930 the ground had lost its original shape. By 1935, the ground capacity was up to 50,000. A record crowd of 51,380 packed into the Ground on 29 March 1937 to watch a league match against Arsenal. Floodlights were installed in 1956 and another new main stand was built. Over the weekend of the 3/4 in January 1976, gale-force winds blew the roof off the Butler Street Stand. Stoke played a home League match against Middlesbrough at Vale Park whilst repair work was on-going. The Stoke End Stand was improved in 1979 and through the 1980s more improvements were made. By 1995, Stoke drew up plans to make the ground an all seater stadium, to comply with the Taylor Report. However, the club decided it would be better to leave the Victoria Ground and re-locate to a new site. 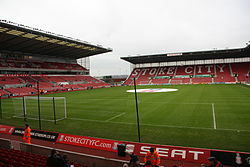 In 1997, Stoke left the Victoria Ground after 119 years, and moved to the modern 28,384 all seater Britannia Stadium at a cost of £14.7 million. Stoke struggled at first to adjust to their new surroundings and were relegated to the third tier in the first season at the new ground. In 2002, a record 28,218 attended an FA Cup match against Everton. With Stoke gaining promotion to the Premier League in 2008, attendances increased. However, the capacity was reduced to 27,500 due to segregation. The name of the ground was changed to the bet365 Stadium in June 2016. While much of the support that the club enjoys is from the local Stoke-on-Trent area, there are a number of exile fan clubs, notably in London and stretching from Scandinavia to countries further afield such as Russia, the United States and Australia. A capacity crowd regularly turn out to see them in the Premier League. Stoke have had problems in the past with football hooliganism in the 1970s, '80s, '90s and early 2000s which gave the club a bad reputation, this was to the actions by the "Naughty Forty" firm which associated itself with the club and was formed by supporter Mark Chester. Mark Chester reformed himself and now works as a youth inclusion promoter. In 2003, the BBC described Stoke City as having "one of the most active and organised football hooligan firms in England". In response to these criticisms, the club introduced an Away Travel ID scheme. This was subsequently suspended in 2008 as a result of improved behaviour and an enhanced reputation. More recently, Stoke City's fans and their stadium have been perceived as loud, friendly, passionate and modern, welcoming as guests Sugar Ray Leonard and Diego Maradona. There is in the media now "genuine admiration for the volume and volatility of the club's loyal support". Stoke announced that they will offer supporters free bus travel to every Premier League away game in the 2013–14 and 2014–15 seasons. 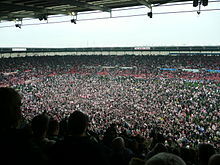 In November 2008, a group of Stoke fans were forced by the Greater Manchester Police to leave Manchester before a league match against Manchester United. The Human Rights group Liberty took up the case of the fans, and Greater Manchester police eventually apologised for their actions and the fans were awarded compensation. Supporters of the club have adopted "Delilah" as their club anthem since the 1970s. It was adopted by the fans after a supporter was heard singing it in a local pub. Some of the song's original lyrics have been adapted for the terraces, but the essence of the song remains the same. Stoke's official club anthem is "We'll be with you" which was recorded by the Stoke players prior to the 1972 Football League Cup Final. Stoke's traditional rivals are Midlands clubs West Bromwich Albion and Wolverhampton Wanderers. Stoke's local rivals are Port Vale, based in the Burslem area of Stoke-on-Trent. As the two clubs have regularly been in different divisions, there have only been 46 league matches between the two sides, with the last match being in 2002. Regardless of the lack of matches, the Potteries derby is often a tight and close game of football with few goals being scored. Stoke have won 19 matches while Vale have won 15. Stoke have an affiliation with Major League Soccer club Orlando City (formerly Austin Aztex) which was founded by former director Phil Rawlins. Stoke also have a strategic partnership with German club FC St Pauli. Stoke's traditional kit is red and white striped shirts with white shorts and socks. Their first strip was navy and cardinal hoops with white knickerbockers and hooped stockings. This changed to black and blue hoops before the club settled on red and white stripes in 1883. However, in 1891 the Football League decided that only one club could use one style of strip per season and Sunderland were allowed to take red and white stripes. So between 1891 and 1908 Stoke used a variety of kits with plain maroon being the most common. In 1908, Stoke lost their League status and were able to finally revert to red and white and when they re-joined the league in 1919 the rule was scrapped. Since then, Stoke have forever used red and white striped shirts, with the only time when they diverted from this was for two seasons in the mid-1980s, which saw them wear a pin-striped shirt. Stoke-on-Trent coat of arms, used as club crest from the 1950s to 1977, and from 1992 to 2001. Stoke's first club crest was a stylised "S" which was used by players in 1882 who would stitch the crest on to their shirts, however this practice soon faded away. In the 1950s Stoke began using the shield from the Stoke-on-Trent coat-of-arms which was used infrequently until 1977. A new and simpler club crest was introduced a Stafford knot and pottery kiln represented local tradition while red and white stripes were also added. This lasted until 1992 when the club decided to use the entire Stoke-on-Trent coat-of-arms which included the club's name at the top of the crest. They changed their crest in 2001 to the current version which includes their nickname "The Potters". For the 2012–13 season, they used a special version to mark the club's 150th anniversary which included the club's Latin motto "Vis Unita Fortior" ("United Strength is Stronger"). For details of former players, see List of Stoke City F.C. players, List of Stoke City F.C. players (25–99 appearances), List of Stoke City F.C. players (1–24 appearances) and Category:Stoke City F.C. players. For player records, including player awards, see List of Stoke City F.C. records and statistics. Main article: Stoke City L.F.C. ^ a b c d e f g h i j k l m n o p q r s t u v w x Matthews, Tony (1994). The Encyclopaedia of Stoke City Football Club 1868–1994. Lion Press. ISBN 0-9524151-0-0. ^ "bet365 Stadium". Premier League. Retrieved 13 August 2017. ^ a b c d "1863–1888 in the Beginning". Stoke City Official Website. Archived from the original on 14 March 2012. Retrieved 13 May 2010. ^ "1888–1900 Election Fever". Stoke City Official Website. Archived from the original on 14 March 2012. Retrieved 13 May 2010. ^ "1910–1920 Rebirth". Stoke City Official Website. Archived from the original on 14 March 2012. Retrieved 13 May 2010. ^ "1920–1930 The Fall And Rise". Stoke City Official Website. Archived from the original on 14 March 2012. Retrieved 13 May 2010. ^ a b c The Oatcake (19 July 2000). "SCFC History". oatcake.co.uk. Archived from the original on 24 October 2005. Retrieved 8 April 2009. ^ "The first gentleman of soccer". BBC News. British Broadcasting Corporation. 23 February 2000. Retrieved 29 June 2007. ^ a b c "1930–1940 Stan's The Man". Stoke City Official Website. Archived from the original on 6 February 2012. Retrieved 13 May 2010. ^ a b "1940–1950 So Near, So Far". Stoke City Official Website. Archived from the original on 14 March 2012. Retrieved 13 May 2010. ^ "1950–1960 A Foreign Affair". Stoke City Official Website. Archived from the original on 14 March 2012. Retrieved 13 May 2010. ^ "Bob McGrory's managerial career". Soccerbase. Centurycomm Limited. Retrieved 12 July 2007. ^ "Tony Waddington's managerial career". Soccerbase. Centurycomm Limited. Archived from the original on 1 October 2007. Retrieved 12 July 2007. ^ a b c d e "1960–1970 Waddo You Believe It (Part One)". Stoke City Official Website. Archived from the original on 18 February 2012. Retrieved 13 May 2010. ^ "Gordon Banks". International Footballer Hall of Fame. IFOF West LLC. Retrieved 2 July 2007. ^ "Gordon Banks (England)". Planet World Cup. Jan Alsos. Retrieved 2 July 2007. ^ Holroyd, Steve; Litterer, Dave. "The Year in American Soccer – 1967". USA Soccer History Archives. Retrieved 8 November 2007. ^ "The English League Cup". Napit.co.uk. Retrieved 12 July 2007. ^ a b c d e "1970–1980 Waddo You Believe It (Part Two)". Stoke City Official Website. Archived from the original on 7 August 2011. Retrieved 13 May 2010. ^ a b "The History of Stoke City Football Club". Red Stripe. Archived from the original on 17 July 2007. Retrieved 29 June 2007. ^ "Stoke City – Formed 1863". rotaski.co.uk/stoke. Retrieved 29 June 2007. ^ a b c d "1980–1990 Five Managers, Five Chairmen". Stoke City Official Website. Archived from the original on 14 March 2012. Retrieved 13 May 2010. ^ a b c d "1990–2000 Two Relegations, A Promotion & A Takeover". Stoke City Official Website. Archived from the original on 14 March 2012. Retrieved 13 May 2013. ^ "Mike Sheron". ex-canaries.co.uk. Retrieved 2 July 2007. ^ "Britannia Stadium". The Stadium Guide. Retrieved 1 July 2007. ^ "Little resigns from Villa". BBC Sport. British Broadcasting Corporation. 24 February 1998. Retrieved 2 July 2007. ^ "Brian Little's managerial career". Soccerbase. Archived from the original on 30 July 2007. Retrieved 12 July 2007. ^ "Wembley glory for Stoke City". BBC Sport. British Broadcasting Corporation. 29 June 2000. Retrieved 1 July 2007. ^ a b c d "2000–2009 The Decade of Success". Stoke City Official Website. Archived from the original on 14 March 2012. Retrieved 13 May 2010. ^ "Stoke sack Thordarson". BBC Sport. Retrieved 3 March 2017. ^ "Pulis gets Stoke job". BBC Sport. British Broadcasting Corporation. 1 November 2002. Retrieved 10 July 2007. ^ "Akinbiyi keeps Stoke up". BBC Sport. British Broadcasting Corporation. 4 May 2003. Retrieved 12 June 2007. ^ "Manager Pulis is sacked by Stoke". BBC Sport. British Broadcasting Corporation. 28 June 2005. Retrieved 1 July 2007. ^ "Boskamp named as new Stoke boss". BBC Sport. British Broadcasting Corporation. 29 June 2005. Retrieved 12 June 2007. ^ "English League Championship Table – 2005/06". ESPN. Disney Corporation. Retrieved 1 July 2007. ^ "Boskamp confirms exit from Stoke". BBC Sport. British Broadcasting Corporation. 30 April 2006. Retrieved 1 July 2007. ^ "Coates takes over as Stoke owner". BBC Sport. British Broadcasting Corporation. 23 May 2006. Retrieved 1 July 2007. ^ "Pulis confirmed as Stoke manager". BBC Sport. British Broadcasting Corporation. 14 June 2006. Retrieved 1 July 2007. ^ "English League Championship 2006–2007". Statto.com. Archived from the original on 8 May 2012. Retrieved 6 May 2016. ^ "Stoke 0–0 Leicester". BBC Sport. Retrieved 7 March 2017. ^ Phillips, Owen (16 August 2008). "Bolton 3–1 Stoke". BBC Sport. Retrieved 6 September 2008. ^ May, John (23 August 2008). "Stoke 3–2 Aston Villa". BBC Sport. Retrieved 6 September 2008. ^ Hughes, Ian (19 October 2008). "Stoke 2–1 Tottenham". BBC Sport. Retrieved 24 October 2008. ^ Hughes, Ian (1 November 2008). "Stoke 2–1 Arsenal". BBC Sport. Retrieved 18 May 2009. ^ Lewis, Aimee (31 October 2008). "Stoke 1–0 Sunderland". BBC Sport. Retrieved 18 May 2009. ^ Phillips, Owen (22 November 2008). "Stoke 1–0 West Brom". BBC Sport. Retrieved 18 May 2009. ^ "Hull City 1–2 Stoke". BBC Sport. 9 May 2009. Retrieved 18 May 2009. ^ "Stoke 2–0 Wigan". BBC Sport. 16 May 2009. Retrieved 18 May 2009. ^ "The long wait is finally over for Potters". thisisstaffordshire.co.uk. Archived from the original on 5 May 2013. Retrieved 14 March 2011. ^ "Man City 1 – 0 Stoke". BBC Sport. 14 May 2011. Retrieved 14 May 2011. ^ "City Boosted By Europa League Spot". stokecityfc.com. Stoke City FC. 11 May 2011. Archived from the original on 16 June 2011. Retrieved 11 May 2011. ^ "Tony Pulis leaves Stoke City after seven years in charge". BBC Sport. Retrieved 22 May 2013. ^ "Mark Hughes: Stoke City appoint former QPR manager". BBC Sport. 30 May 2013. Retrieved 30 May 2013. ^ "Three-year deal for Mark Hughes as new Stoke City era begins". The Sentinel. 30 May 2013. Archived from the original on 14 June 2013. Retrieved 30 May 2013. ^ "West Brom 1–2 Stoke". BBC Sport. Retrieved 23 May 2014. ^ "Stoke 6–1 Liverpool". BBC Sport. Retrieved 19 July 2015. ^ "Stoke 2–1 West Ham". BBC Sport. Retrieved 1 June 2016. ^ "Southampton 0–1 Stoke". BBC Sport. Retrieved 22 May 2017. ^ "Mark Hughes: Stoke City sack manager after poor run". BBC Sport. 6 January 2018. ^ "Paul Lambert appointed Stoke manager". BBC Sport. 16 January 2018. ^ Henson, Mike (5 May 2018). "Stoke City 1–2 Crystal Palace". BBC Sport. Retrieved 5 May 2018. ^ "Gary Rowett: Stoke City name Derby County boss as their new manager". BBC Sport. Retrieved 22 May 2018. ^ "Gary Rowett: Stoke City manager sacked after less than eight months". BBC Sport. Retrieved 8 January 2019. ^ Nicholson, Fraser (9 January 2019). "Jones named new manager". Stoke City F.C. Retrieved 9 January 2019. ^ "The Britannia Stadium". merseysidepotters.com. Retrieved 30 October 2010. ^ "Home of Stoke City Now Known As bet365 Stadium". Stoke City F.C. Archived from the original on 1 June 2016. Retrieved 1 June 2016. ^ "Stoke City Supporters Clubs". Stoke City F.C. Retrieved 29 February 2012. ^ "Record Breaking Attendances". stokecityfc.com. Archived from the original on 31 May 2010. Retrieved 3 January 2011. ^ "Running with the 'Naughty Forty'". BBC News. 2 May 2002. Retrieved 1 April 2010. ^ "Hooligan Troublespots". BBC News. Retrieved 7 February 2011. ^ "More 'thugs' banned from Cardiff City". BBC. BBC. 11 October 2009. Retrieved 11 October 2009. ^ "Reformed Naughty Forty hooligan tells his tale". BBC News. Retrieved 29 February 2012. ^ "ID scheme 'big success'". BBC Sport. British Broadcasting Corporation. 22 January 2003. Retrieved 18 January 2008. ^ "Stoke axe ID cards for away fans". BBC Sport. British Broadcasting Corporation. 24 October 2008. Retrieved 25 October 2008. ^ a b "Fanatical supporters backing City to hilt". thisisstaffordshire.co.uk. Retrieved 7 February 2011. ^ "Sugar Ray's Surprise Visit". stokecityfc.com. Archived from the original on 12 January 2016. Retrieved 31 January 2011. ^ McNulty, Phil (10 January 2009). "Stoke 0–0 Liverpool". BBC Sport. Retrieved 31 January 2011. ^ "Stoke City fans offered free travel for away games". BBC Sport. Retrieved 20 July 2013. ^ Porter, Henry (24 November 2008). "The phantom fan menace". The Guardian. London. Retrieved 1 April 2010. ^ "Liberty fight for football fans' rights". politics.co.uk. Retrieved 7 February 2011. ^ "Police apologise to Stoke City fans". Sentinel. Sentinel. 14 January 2009. Retrieved 11 October 2009. ^ "Stoke City fans receive £185,000 after police bar them from Man Utd game". thisisstaffordshire.co.uk. Retrieved 7 February 2011. ^ "Stoke City fans back Tom Jones's Delilah to top charts". BBC. 5 May 2011. Retrieved 25 May 2011. ^ "Stoke City: When will the ugly truth finally dawn on Baggies?". thisisstaffordshire.co.uk. Retrieved 7 February 2011. ^ "Stoke City v Port Vale". footballderbies.com. Retrieved 7 February 2011. ^ "Potteries Derby Records". stokecityfc.com. Archived from the original on 16 July 2011. Retrieved 7 February 2011. ^ "Orlando City SC Announces Formal Affiliation with English Premier League's Stoke City FC". 6 May 2016. Retrieved 29 June 2018. ^ "CITY ANNOUNCE PARTNERSHIP WITH ST. PAULI". Stoke City. Retrieved 30 June 2018. ^ "Teams: First-team". Stoke City F.C. Retrieved 9 August 2018. ^ "Club Directory". Stoke City. Retrieved 25 January 2018. ^ "Club Honours". Stoke City. Archived from the original on 14 January 2018. Retrieved 20 February 2016. ^ "Transfer deadline day: Stoke City sign Giannelli Imbula from Porto". BBC Sport. Retrieved 1 February 2016. ^ "Marko Arnautovic: West Ham sign Stoke City and Austria forward for £20m". BBC Sport. Retrieved 29 July 2017. ^ "Stoke 6 – 1 Liverpool". BBC Sport. 24 May 2015. Retrieved 24 May 2015. ^ "Chelsea 7 – 0 Stoke". BBC Sport. 25 April 2010. Retrieved 18 May 2011. ^ "Stoke 1–2 Everton". BBC Sport. Wikimedia Commons has media related to Stoke City FC.